SO proud to share this advert which came out today! The Kaos Signing Choir for Deaf and Hearing Children performing the choral backing music! We are also mentioned in this article about the advert. "As for the idea itself, Lee says that his in-house team approached Jonze with the concept, which he helped to "elevate and make as memorable to the viewer as possible, injecting his signature dreamlike style." The team had the idea to use "Que Sera, Sera," but Jonze and team took it further and suggested using a little girl's voice, along with backing from The Kaos Signing Choir for Deaf & Hearing Children "to help create an imperfect and fragile version of the song," says Lee. "The selection of the London children's choir was deliberate, as we wanted to tie the song back to Idris' Hackney roots." There are places available for Kids' Kaos, Organised Kaos and Kaos Youth Music Theatre. Kaos Signing Choir for Deaf and Hearing Children opened Rotary Makes Music with a bang last Thursday. Kids from all our groups, Youth Music Theatre, Organised Kaos, Kids Kaos and Highgate and Blanche Nevile Schools got together to perform 4 joyously received songs, to make sure the evening got off to the best possible start for a packed audience at London's famous Royal Festival Hall. We were especially pleased to welcome our latest group, the Enfield Integrated Signing Choir, for their first Kaos show. This brand new venture incorporates West Lea, Meridian Angel, Raynham and St. John & St. James Schools and all the children taking part had a wonderful experience. We'd like to thank Clive and all our friends at the Rotary Club for inviting us to be a part of this exciting event. 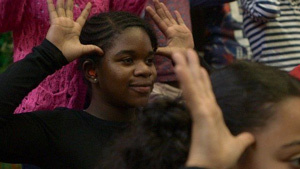 Fun was had by all at the Kaos Youth Music Theatre open workshop. The kids performed improvs, devised sketches, monologues, songs (signed and staged) and even encouraged - or coerced - some crowd participation. It all ended with a Christmas singalong and a warm and fuzzy feeling amongst cast and audience. Plans are afoot for a show next year, so if you know someone aged 11-18 who'd like to be involved, get in touch through the website or just rock up at Jackson's Lane, 5 o'clock Fridays. Kaos Youth Music Theatre is having a Christmas Open Workshop at Jackson's Lane, 8th December at 6.15. Come along to see what we've been working on this term and have an early Christmas singalong. And if you feel the urge, and you're between 11 and 18, why not join us in the new term? We are inviting new members to our vibrant and friendly group. All abilities welcome, Fridays, 5 to 7. Time and Space are no barrier to the ghostly goings-on at Nighmare Hall... This video from 2015 brings together some of the different groups that make up The Kaos Signing Choir from their individual workshops. Nightmare Hall opens its creaking doors to all the Friends of Frankenstein, as Winnie the Witch, Wilfred Wizard, the Bogey Boogiemen, the Rock'n'Roll Trolls and limelight-hogging harpy Chiller Black ghoulishly gather to find out who's won the Creepy Cup... Monstrously good fun! Halloween On Horror Hill is a whole show in one song - ideal for October classroom fun and for assemblies and concerts. Now available as a Multimedia Bundle (digital download) which includes: BSL signed video (mp4), digital audio - both full song and piano backing track version (mp3), Digital Sheet Music, Workshop Notes and Lyrics (pdf). Join us on Monday 5th December at Earl Haig Hall, N8 for a fun-filled fundraiser. Bring a team or find your team mates on the night. Live music from the Angels of Kaos. A BSL signed event. £7 on the door. 7pm for 8pm Quiz start. Full size poster for printing. We are so proud of The Kaos Signing Choir for Deaf and Hearing Children who appeared on Teletubbies today. Well done everyone! The BBC came along to film rehearsals and a recent performance at Brent Civic Centre for a feature that went up on the BBC website today. A big thank you to all the members of The Kaos Signing Choir who came to sing Christmas songs in Crouch End to raise funds for the Rotary Club on Saturday 12th December. Thanks to John Shields for the video. Time and Space are no barrier to the ghostly goings-on at Nighmare Hall this year... This new video of Halloween On Horror Hill brings together some of the different groups that make up The Kaos Signing Choir from their individual workshops. 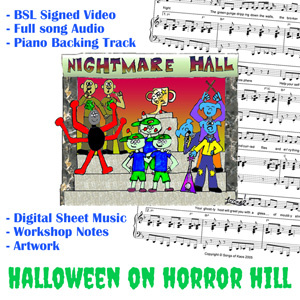 Halloween On Horror Hill is a whole show in one song - ideal for use in the classroom and for assemblies and concerts. Now available as a Multimedia Bundle which includes: BSL signed video (mp4), digital audio - both full song and piano backing track version (mp3), Digital Sheet Music, Workshop Notes and Lyrics (pdf). 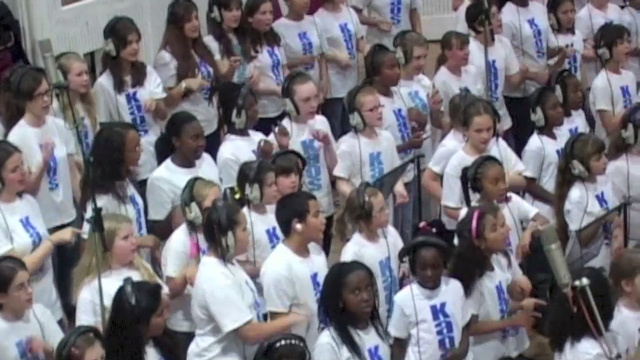 The Kaos Signing Choir for Deaf and Hearing Children is releasing a new song dedicated to their Global Patron, Archbishop Desmond Tutu, on Sunday April 28th 2013. The song ‘One Earth, One Sky’ was recorded especially for the Archbishop at Abbey Road Studios and incorporates singing and British Sing Language. The song will be available for download from Monday 29th April. The launch will take place at 3 – 4pm on Sunday 28th April 2013 at St. Mary’s Junior School, Rectory Gardens, London, N8 7QN. In 2008 the Archbishop contributed a one-of-a-kind drawing to the charity’s Celebrity Angel Artworks Auction. The Archbishop also sent the following message ‘I think I probably pray better than I draw but I have made an attempt. I hope it will be helpful to the choir in their fundraising efforts. God bless you.’ His drawing was sold at an auction at Alexandra Place. The whole event raised £6,000 to help The Kaos Organistation to continue its activities. In 2012, the Archbishop became the charity’s Global Patron. Since then the choir has gone from strength to strength. They performed the British National anthem at The London 2012 Olympic Opening Ceremony for the Queen and a UK audience of 27.3 million people. The charity receives no formal funding and relies completely on donations and money raised from the sale of songs like ‘One Earth, One Sky’ and DVDs. The charity will host a fundraising event, Art & Soul a night of celebrity art and auction fun on July 12th. Details can be found on the website. Video and Audio available on our Media Page.